As an owner of vacation property in New York, I feel qualified to write this review. I felt that the owner was not forthcoming about his property. the railroad tracks were in a valley approximately 100 meters from the apartment. The constant breeze He mentioned, because of cross ventilation, was non-existant. There WAS Internet. But that's not very helpful or offering anything, as there's Internet everywhere. (Except maybe in a tunnel or at sea). And yes, he did state in 'notes' there was no WIFI. Later he wrote for free WIFI I could down go to a local bar. That meant walking down 100 steps on an old stone staircase and then finding a bar in town about 1000 meters away. We left having very little sleep and checked into a wonderful hotel. I would never recommend this apartment to anyone. In all the area there is the train railway, it cross the village beyond the road, the noise is not strong. The WiFi is present, limited at 15 gigabyte. I stayed at the flat with my daughter - so it was important that we felt secure. It was an ideal location in the sense that it was near everything - 5 mins to a lovely nearby beach, 5 minutes to the beautiful town, and we discovered that if you walked up the hill, you could explore other tiny villages, a michelin starred restaurant and the mountains - plus the next cove along. Nice views and Moneglia is a great base for the cinque terre which can get very busy. We loved Vernazza. We didn't have a car - so this was a real bonus. It does mean the train is very PRESENT throughout the area! But we did get used to it. The lovely Elena picked us up from the station and we went to the beach as she prepared the flat - so we felt well looked after. My only thoughts are that the bedroom could do with a fan, and that if you're into minimalism or white interiors, it isn't the flat for you. It is very much of its time, which I would guess is 60's/70's - perhaps older. We rather liked this! Nice outdoor space. Pros: Roberto was very responsive to all my questions and emails. The apartment was on the hill just 5-7 min walk to the downtown and beach. There was a stairs that lead to a shortcut that made it very easy. The little outside area was nice to have breakfast or hang some of the wet beach "stuff." The view of the rooms were great, overlooking the beach and town. Cons: The apartment is on the first floor with the windows facing the street. At night, with all the vespas going by until late at night, made it hard to sleep. Plus, the train tracks were just below us coming quite often until past midnight. I felt that were trains and vespas driving into our apartment. We were there in June 2017 and was pretty hot, but there were no fans to cool off. We told Roberto that we were going to get there by 21:00 but our apartment was not ready until 22:00. We had a long day and just wanted to crash when we got there. It should have been ready. Unfortunately this week was very hot, usually in the evening there is a fresh air. The little delay was for a careful cleaning. 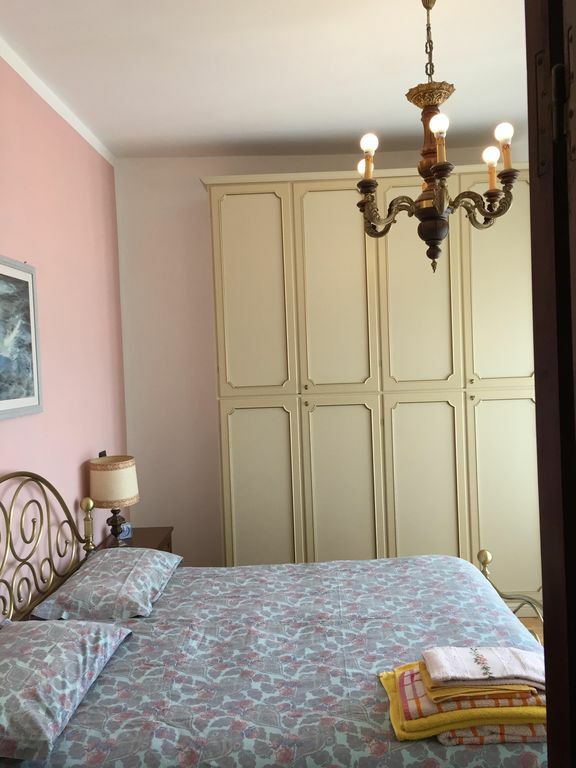 Moneglia is the perfect place to stay on the Italian Riviera, and this is the perfect place to stay in Moneglia. The town has two great beaches (both a short walk away) and lots of nice shops and places to eat - the locals are friendly too - which adds a lot to the experience. The Cinque Terre is a short train ride to the south and Portofino is a short train ride to the north. The apartment is very well furnished and is spotlessly clean. There's a nice terrace to sit and eat outside and a great view of Moneglia from the dining room table inside. All in all, a great place to relax and a great base for exploring one of the most spectacular parts of Italy. The apartment is fully conformable to the advert. It very comfortable and well-placed. The only issue is the railway road quite close to the apartment and it can be noisy on night s, but earplugs can solve this problem. "Roberto is a very helpful and friendly and we had the best treatment possible. The appartment was clean and had a nice terrasse. Parkinglot was very near by. The biggest issue was the traffic noise, that continued until late night. The appartment was plain and ok - although there was only one bedroom and a living room with 2 sofabeds." By plane, airport Genova 50 km, by train (50 minutes. Airports Milano Malpensa, Milano Linate and Milano Orio al Serio by train from Milano Centrale rail station 3 hours. By car highway toll gate Sestri Levante, after tunnel 20 minutes. By train from Pisa airport to Moneglia's station 2 hours. We are on the eastern coast of Liguria, the Riviera di Levante, a land of ancient flavours framed by spellbinding vegetation. The sea of the Cinque Terre is a very particular sea and coast. The temperature of the air in summer is 25/30 degrees, the water is 24/28 degrees. In Spring and Fall very good weather for trekking and smimming in the sea. Deposito cauzionale, Caparra richiesta alla prenotazione, Consegna delle chiavi da parte del Proprietario non presente in locorietario, Proprietario non presente in loco. WI-FI in tutto il centro e in tutti i bar di Moneglia gratuito.